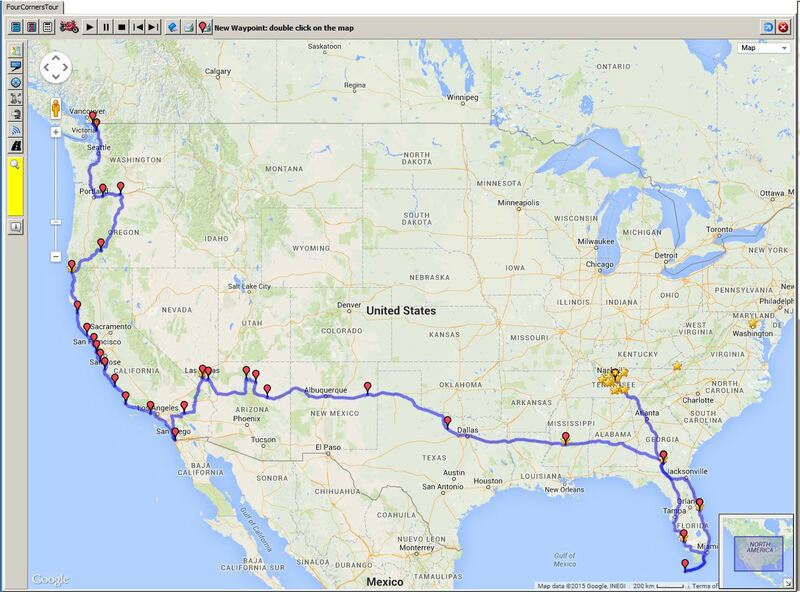 So I am attaching a map of my epic motorcycle tour that includes the AWFS 2015 trade show right in the middle of it all. This map covers the first 3 legs of the trip, which starts in Nashville Tennessee, then I work my way down to Key West, Florida for the first corner, then on to Las Vegas for the trade show where we will be introducing the next generation of the Business Partner Estimating Software, then on to the second corner in San Ysidro, California. I then plan to ride up the west coast line mostly on Hwy 1 and Hwy 101 with the ultimate destination of that leg being Blaine, Washington. If you see that my journey brings me anywhere near your area of the country, I would love to meet up for a meal, or if you ride, I would welcome anyone that wants to tag along for a day, or a couple days for that matter. I already have several lunch and dinner appointments along the way, and would love to get the opportunity to meet some of you for the first time, and get to visit with some of my longtime good friends as well. Once I get to Blaine, Washington, I'll have to decide if I am going to go for the 4th corner (I'm leaning that way right now), but it will turn my more than 6000 trip into something more than an 8000 mile trip, and I'm just going to have to see how it goes up to that point (it's still a long way home if I leave Blaine with the intent to just go home). In the coming weeks I will most likely develop two routes, one heading towards home, and another that takes me to Madawaska, Maine, and then down the east coast towards home, which should have me coming fairly close to lots of cabinetmakers, so if you are close to either of these two paths, keep an eye out for my final decision, and if I'm riding through your area, lets break bread together. You can call or text me at 615-682-3447 (I can take calls on the bike via a Bluetooth unit that integrates my phone with the bikes audio system). If you just want to follow along and you have an iPhone, download the Find Friends app, and search for me using my bbuckleyt32@gmail address. This app will allow you to see where I am at anytime of the day or night, as long as I have cell phone service (you can come along with me virtually). That's an awesome run! What did you figure time-wise taking into account stops, appointments, etc. No sense advising what to take, what to leave, I'm sure you've given good thought to it. I'll have 16 traveling days at that point (when I arrive in Blaine, WA), but a total of 24 days away from home (I have a family vacation planned while in Naples, Florida, then another 4 days in Las Vegas for the AWFS 2015 Show). I'm hoping to keep all my appointments to times I would have stopped for a meal anyway, and at places along my route (it's worked for a few already). My list of what to take is pretty long since I have quite a few challenges, the largest being that I am camping all the way, and the weather will most likely range from a low in the 20's and a bunch of highs well above 100 degrees. To add to that, a few of the state parks don't have electricity available, so not only will I have a 5000 btu air conditioner on board, I will also have a Honda 2000 watt generator on-board. With that said, I am always open to suggestions on what to bring (been sleeping in the camper in my driveway on and off over the past few weeks testing all my gear, and improving my skill at setting and breaking camp). So all you campers, and touring bikers, please feel free to fill me in on things you would never leave home without (other than your American Express card). I'm really going to be pushed when I reach Blaine since I will arrive after riding 412 miles that day including riding the Columbia River Hwy., and I'm still hoping to arrive early enough to get a Tour of the new Fastcap facility and spend some time with Paul Akers. If Mel were willing to pop down to Bellingham for breakfast on the 31st, then I would welcome the opportunity to meet him. If you're in the Los Angeles area you would be welcome to stop by our shop and have lunch with us. I'd love to hear about other shops you have visited and tell you about mine. All my contact info is there. Do you mean Millennial Mel? I would love to see your shop, and I will be really close by on the evening of July 26th. I have a reservation at the Malibu Creek State Park, which is where I will be setting up camp for that night. If you are interested in meeting me at the campground, and then driving me to your plant, and maybe we can grab dinner afterwords, that would be great. The reason I ask that you come get me is I am on a motorcycle, and am pulling a camper. First, if you think it is hot walking from your shop to your truck, add a significant factor to that heat index sitting on a motorcycle at 100 red lights (we like to keep moving if at all possible). Although I definitely qualify as a motorcycle enthusiast, I am also a guy that weighs the odds on any adventure I set out on (riding motorcycles, running a cabinet manufacturing plant, raising kids and grand-kids), I just don't like my odds riding in large metropolitan areas that I am not familiar with. So if your willing, send your contact information to bbuckley@businesspartnersoftware.com, and I will keep you posted of my progress on the 26th, and maybe we can get together. Oh yeah, and you got to bring me back to the campground afterwords if you don't mind. If you are going to Maine stop and see me in Northern Vermont it would be right on the way. I am one town south of Burlington right next to lake Champlain. Very pretty country. You are welcome to spend the night. Plus mortorcycling will be very safe at that time of the year because the snow will almost be gone. Send me your current contact information at bbuckleyt32@gmail.com and I will keep you posted on my ride itinerary, and hopefully we can get together when I'm coming through that area.